You’re Invited – Free Arts Education Event For The Whole Community! Back by popular demand, the Lehigh Valley Arts Council is proud to present the second annual Young at Art Expo on March 11, 2017. Won’t you join us? Our goal is to connect families to the arts community in an expo-style event that’s both engaging and educational. Held at Penn State Lehigh Valley from 10:00am to 2:00pm, we invite children of all ages and abilities to enjoy an entertaining and creative day – FREE to Lehigh Valley families! The day will be jam-packed with hands-on activities and performances from the participating groups, from dance routines and theatre workshops to arts demonstrations and craft projects. Information will be available for classes and camps that are perfect for creative learners. Come dance, sing, create and play! Enjoy fun with the whole family! Enjoy FREE face painting provided by Funtastic Faces and Body Art! 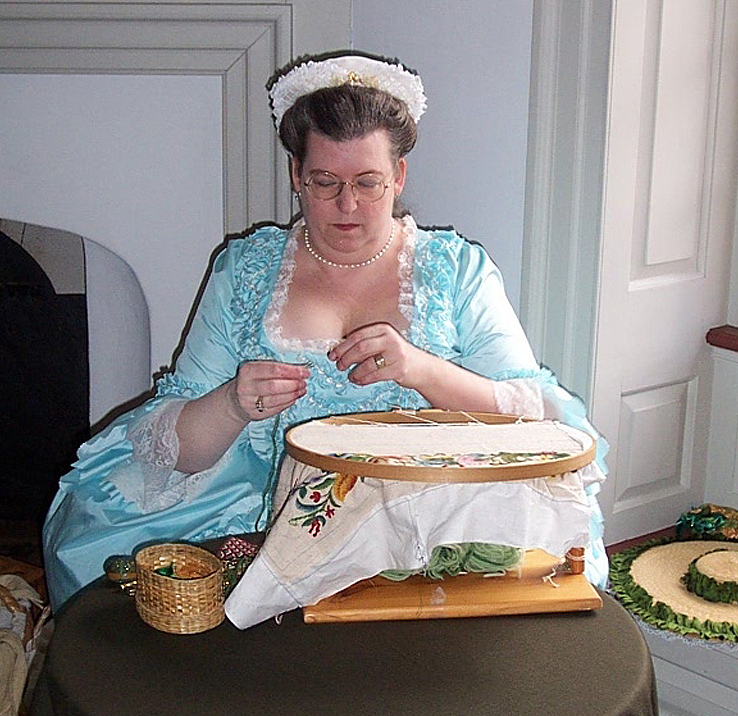 Pottstown, PA – On August 7th, 14th, 21st, and 28th, 2016 from 1:00 pm to 4:00 pm, Pottsgrove Manor’s living history volunteers, dressed in colonial period clothing, will be living life the 18th century way. Come spend a casual summer Sunday afternoon at historic Pottsgrove Manor and enjoy the 18th century surroundings as volunteers demonstrate colonial trades and pastimes. Activities may include needlework, tape weaving, hornsmithing, cooking, and more. Visitors can watch, learn, and even join in! Activities will vary from week to week, so call ahead or check the site’s webpage at http://www.montcopa.org/PottsgroveManor to find out what will be offered each day. A donation of $2.00 per person is suggested for this program. Guests can also tour the manor house, see the museum’s current exhibit, “Potts & Family: Colonial Consumers,” and shop in the museum store during their visit. The “Colonial Consumers” exhibit can also be viewed during a guided tour of Pottsgrove Manor during regular museum hours now through November 6th. Regular museum hours are Tuesday to Saturday from 10:00am to 4:00pm and Sunday from 1:00pm to 4:00pm. Tours are given on the hour. The last tour of the day begins at 3:00pm. The site is closed Mondays and major holidays. 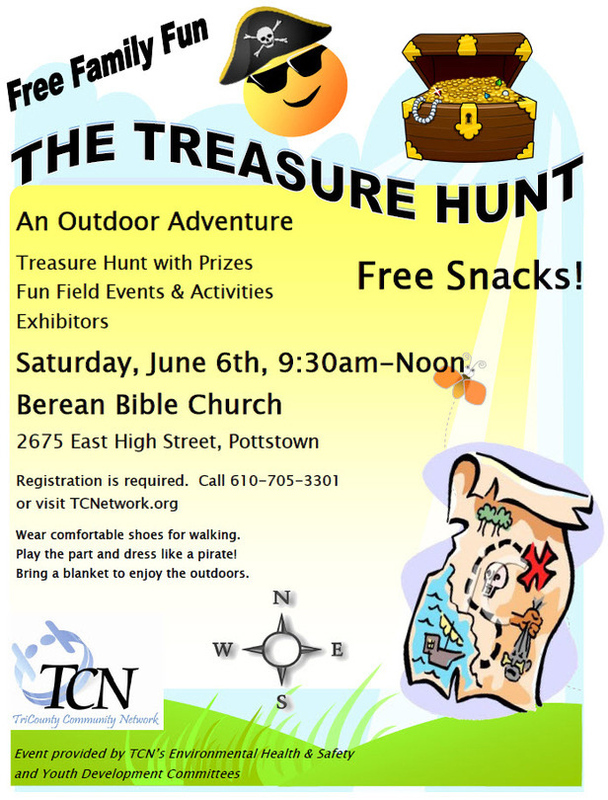 Groups of ten or more should preregister by calling 610-326-4014. 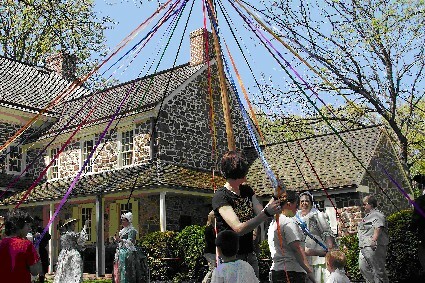 Pottstown, PA – Celebrate spring at the Annual Colonial May Fair held at historic Pottsgrove Manor on Saturday, May 7, 2016 from 11:00 am to 5:00 pm. This yearly event is a fun-filled day with activities for all ages including games, music, dancing, and crafts. Tucker’s Tales Puppet Theatre will present interactive puppet shows and will also provide festive historic music around the grounds during the event. Signora Bella will delight audiences with her acrobatic feats. Colonial conjurer Levram the Great will perform historically-themed magic shows and entertain visitors with pocket magic tricks throughout the day. Members of the Tapestry Historic Dance Ensemble will demonstrate authentic English country dances. As always, visitors will be invited to join in and dance around the maypole to help open and close the fair! In addition to the entertainment, a variety of early American crafters and demonstrators will be on hand to display historic skills and trades and sell their wares. Young visitors will have the chance to meet colonial farm animals, watch a blacksmith at work, see how candles were made, play with colonial toys, try an 18th-century bat-and-ball game, dance around a child-size maypole, help churn butter, and more! New this year, the site will also be offering free make-and-take crafts for kids. The first floor of colonial ironmaster John Potts’ 1752 manor house will be open for self-guided tours during the fair. Visitors will also be able to shop at the manor’s museum shop for colonial games, books, and unique gifts. MMG Concessions will offer a variety of refreshments for sale, including burgers, cheesesteaks, hot dogs, sausages, sandwiches, fries, hand-rolled pretzels, and fresh-squeezed lemonade. The fair coincides with the third annual “Pow-Wow on Manatawny Creek,” celebrating the culture and traditions of the Lenni-Lenape Native Americans. The pow-wow will be taking place during the hours of May Fair and will be held at Memorial Park, less than a block from Pottsgrove Manor. The public is encouraged to visit both events for an experience that spans time periods and cultures! 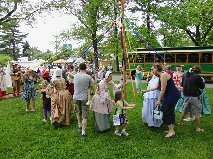 For a schedule of the day’s activities and a list of vendors and craftspeople that will be at the fair, please visit http://www.montcopa.org/1421/Annual-Colonial-May-Fair. A donation of $2.00 per person is suggested for this event. Visitors can park for free at the Carousel at Pottstown building, 30 West King Street. Limited overflow parking is available at the Pottstown Quality Inn across the street from the Manor. Paid parking is also available in the “shop & park” lot at High and Hanover Streets in downtown Pottstown. There will be free trolley rides during the fair between the carousel parking lot, the pow-wow at Memorial Park, downtown Pottstown, and Pottsgrove Manor. Handicapped parking is available in the museum’s parking lot. County under the direction of the Parks, Trails, and Historic Sites Division of the Assets and Infrastructure Department. For more information, please call 610-326-4014, or visit the website at www.montcopa.org/pottsgrovemanor. Like Pottsgrove Manor on Facebook at www.facebook.com/pottsgrovemanor. Our most popular event! Fun for the whole family! We’ll be planting lots of trees and shrubs along Penn’s Woods Trail and can use all the help we can get! Hope to see you there! Explore the best towns to live in the US. Niche ranks towns based on livability using grades for weather, safety, schools, and access to activities, jobs, housing, and transportation. A high ranking indicates that a town offers a high quality of life to its residents. 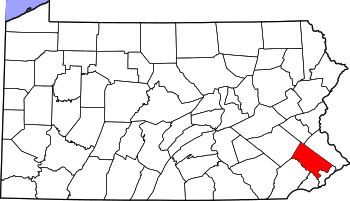 WILKES-BARRE, PA — Is there hope for Sherman Hills? The bigger question — Is there hope for the City of Wilkes-Barre? The Restored Church on North Franklin Street will do its part to try to revive the city’s morale and its pride, and eliminate its fear. The church will hold an event — “I Love My City” — on Saturday, April 25 in the Sherman Hills apartment complex parking lot. All residents of the city are welcome with their children. The church hopes the event will serve as a catalyst for similar events to be held. Blue Bell/Pottstown, Pa—Montgomery County Community College (MCCC) will join communities across the world in celebrating Earth Day 2014, the theme of which is “Green Cities.” Launched in fall 2013, the Earth Day Network’s “Green Cities” campaign focuses on three key elements of sustainability: energy, green building and transportation. While Earth Day itself is observed annually on April 22, MCCC will hold a variety of activities on April 21-24. All events are free of charge and are open to the community. For information, visit MCCC’s Think Green blog at http://www.mc3green.wordpress.com. On Monday, April 21, MCCC will dedicate its new wind turbines during a 2 p.m. ceremony at its West Campus in Pottstown. Four 25-foot vertical axis wind turbines were recently installed outside MCCC’s Schuylkill Riverfront Academic and Heritage Center at 140 College Drive. The turbines are part of MCCC’s Guaranteed Energy Services Agreement with Siemens Industry Inc.
Each turbine produces 1,000 watts of energy, for a combined 4,000 watts, which helps to power the LED lighting in the Center’s parking lot. The wind turbines also serve as a teaching and learning tool for MCCC’s lab science courses, among others. On Tuesday, April 22, Earth Day, MCCC will hold an Eco Style Fashion Show from noon-2 p.m. in the Parkhouse Hall Atrium at the College’s Central Campus, 340 DeKalb Pike, Blue Bell. Coordinated by Public Relations student Katrina Lundy, the event will feature MCCC students modeling sustainable outfits from Plato’s Closet, of Willow Grove, and from the College’s Barnes & Noble Campus Bookstore. Then, from 1-2 p.m., MCCC will introduce its new “greener” transportation shuttle during a ceremony on the Central Campus quad, outside of the Advanced Technology Center. The new vehicle runs on compressed natural gas as opposed to traditional diesel fuel, which, according to the Alternative Fuels Data Center, will reduce emissions by 11 tons of carbon dioxide annually based in the vehicle’s 2013 mileage of 28,560. MCCC partners with the Greater Valley Forge Transportation Management Association (GVF) to operate the 20-passenger shuttle to help students commute between its Blue Bell and Pottstown campuses. The shuttle makes four round-trips per day, Monday through Friday during the fall and spring semesters; it is free to students and is equipped with wi-fi. Last year, the shuttle program reduced vehicle mileage by more than 520,000 and eliminated emissions of more than 54,500 metric tons of greenhouse gases. Next, the College will hold its annual Earth Day Block Parties from 11:30 a.m.-1:30 p.m. on Wednesday, April 23 in the South Hall Lobby at the West Campus, 101 College Drive, and on Thursday, April 24 in the Advanced Technology Center atrium at the Central Campus, 340 DeKalb Pike, Blue Bell. The block parties will showcase sustainability initiatives and activities from programs, classes, departments and individuals from throughout the College. Exhibits include the student Environmental Club; RecycleMania; Green Office Initiative; carbon footprint calculations; SEPTA, Zimride and other transportation options; green merchandise from Barnes & Noble Campus Bookstores; Siemens self-funding energy conservation project; CulinArt Farmers Market; sustainable Economics poster session; composting; health-related information; Culinary Arts Institute Landfill-Free Initiative; spring bike maintenance; and more. Since signing the American College & University Presidents’ Climate Commitment in 2007, sustainability has become a core value at Montgomery County Community College and is incorporated into the institution’s strategic plan, core curriculum, and in everyday best practices as they relate to facilities management, campus operations and transportation. Chaired by President Dr. Karen A. Stout, a team of faculty, staff, students, alumni and community members comprise the Climate Commitment Advisory Council, which guides sustainability efforts toward attaining carbon neutrality by 2050. To learn more about the MCCC’s Sustainability Initiative, visit http://www.mc3green.wordpress.com. Although the National Weather Service is predicting below freezing weather for the first day of 2014, that has not stopped local groups of finding fun ways to ring in the new year. The 6th Pottstown Polar Bear Club’s celebration and bonfire will begin at 10 a.m. at Riverfront Park. Residents willing to brave the icy water can dive into the Schuylkill River at 10:30 a.m. then warm up with hotdogs, sauerkraut for $2 as well as hot chocolate and coffee for $1. Registration for the plunge starts at 9 a.m. at the park and ends at 10 a.m. at which time the bonfire will be lit. POTTSTOWN, PA — A combination of perfect weather, lively music and Frisbees brought thousands out to the Circle of Progress Saturday for the annual Sly Fox Can Jam. Crowds gathered in the grass lot next to the Pottstown Sly Fox location where a stage was set up for the acts which came through, headlined by Toy Soldiers. “We’re big music fans and we really wanted to find some good bands that play music you can enjoy beer to,” said Sly Fox Brewmaster Brian O’Reilly. Pottstown, PA – On Friday, October 4, 2013 from 10:00am to 2:00pm, bring homeschoolers out to historic Pottsgrove Manor for a fun-filled and educational field trip that will let them explore the skills, trades, and pastimes of the 18th century with the site’s fourth annual Homeschool Day. Around the grounds, children will be able to participate in hands-on activities led by Pottsgrove Manor’s staff and volunteers. Activities will include candle-dipping, apple cider-pressing, writing with a quill pen, dancing and etiquette lessons, tape-weaving, and much more. Guests will get to meet sheep from Red Rope Farm and learn how their hair would be spun into yarn. Demonstrations of open-hearth cooking will take place in the manor’s kitchen. The first floor of the Pottsgrove Manor mansion will be open for self-guided tours, with volunteers stationed in the rooms to share the house’s history and answer questions. The museum shop will be open for the purchase of books, games, souvenirs, and more. This program is ideal for elementary-aged students and is open to individual homeschool families, homeschool groups, and small school and church groups. The cost is $5.00 per child. Call 610-326-4014 to preregister or for more information. Groups are encouraged to preregister. Activities will be ongoing throughout the day; allow at least two hours for the visit. As most activities will be outdoors, this program will be held weather-permitting. Limited parking and handicapped spots are available in the Pottsgrove Manor parking lot. Visitors may also park directly across on King Street in the Quality Inn parking lot. Pottsgrove Manor can also be toured during regular museum hours Tuesday to Saturday from 10:00am to 4:00pm, and Sunday from 1:00pm to 4:00pm. Tours are given on the hour. The last tour of the day begins at 3:00pm. The site is closed Mondays and major holidays. Groups of ten or more should preregister by calling 610-326-4014. Pottstown Manor is located at 100 West King Street near the intersection of King Street and Route 100, just off Route 422, in Pottstown, Pennsylvania. Pottsgrove Manor is operated by MontgomeryCounty under the direction of the Parks, Trails, and Historic Sites Division of the Assets and Infrastructure Department. For more information, please call 610-326-4014, or visit the website at www.montcopa.org/pottsgrovemanor. Like Pottsgrove Manor on Facebook at http://www.facebook.com/pottsgrovemanor. If the Antietam and Exeter school districts were to combine in some form, students from both could take advantage of a minimum of 42 new course offerings. They’d also have access to 10 different buildings and added athletic facilities. And have the opportunity to take part in up to 31 new clubs and activities. 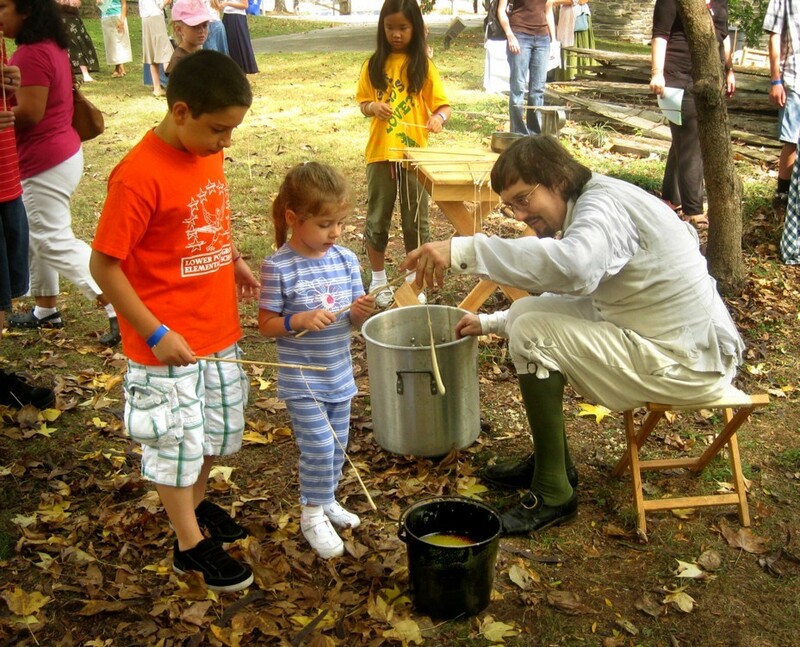 Pottstown, PA— Celebrate spring at the Annual Colonial May Fair held at historic Pottsgrove Manor on Saturday, May 4th from 11:00am to 5:00pm. This yearly event is a fun-filled day with activities for all ages—games, music, dancing, and crafts. Colonial conjurer Levram the Great will perform historic magic shows and entertain visitors with pocket magic tricks throughout the day. Tuckers’ Tales Puppet Theatre will perform the puppet shows St. George and the Dragon and Cinderella and will also provide festive historic music around the grounds during the event. Signora Bella is returning this year to delight audiences with her acrobatic feats. Members of the Tapestry Historic Dance Ensemble will demonstrate authentic English country dances and will lead visitors in dances around the Maypole to open and close the fair. In addition to the entertainment, a variety of Early American crafters and demonstrators will be on hand to display historic skills and trades and sell their wares. Young visitors can compete in hoop races, play with colonial toys and games, help churn butter, and more! The first floor of colonial ironmaster John Potts’ 1752 manor house will be open for self-guided tours during the fair. Visitors can also shop at the Manor’s museum shop for colonial games, books, and unique gifts. Historic foodways expert Deborah Peterson will be demonstrating open-hearth cooking in the Pottsgrove Manor kitchen. While visitors can’t try the food cooked in the colonial kitchen, they will be able to purchase food during the event. MMG Concessions will offer burgers, cheesesteaks, hot dogs, sausage sandwiches, fries, hand-rolled pretzels, fresh-squeezed lemonade, and more. For a schedule of the day’s activities and a list of vendors and craftspeople who will be at the fair, please visit Pottsgrove Manor’s website and follow the “Annual Colonial May Fair” link. A donation of $2 per person is suggested for this event. Visitors are asked to park at the Carousel at Pottstown building, 30 West King Street. There is no charge for parking, and Pottstown’s restored trolley will be giving FREE rides during the fair between the Carousel parking lot and Pottsgrove Manor. Handicapped parking is available in the museum’s parking lot. Pottsgrove Manor is located at 100 West King Street near the intersection of King Street and Route 100, just off Route 422, in Pottstown, Pennsylvania. 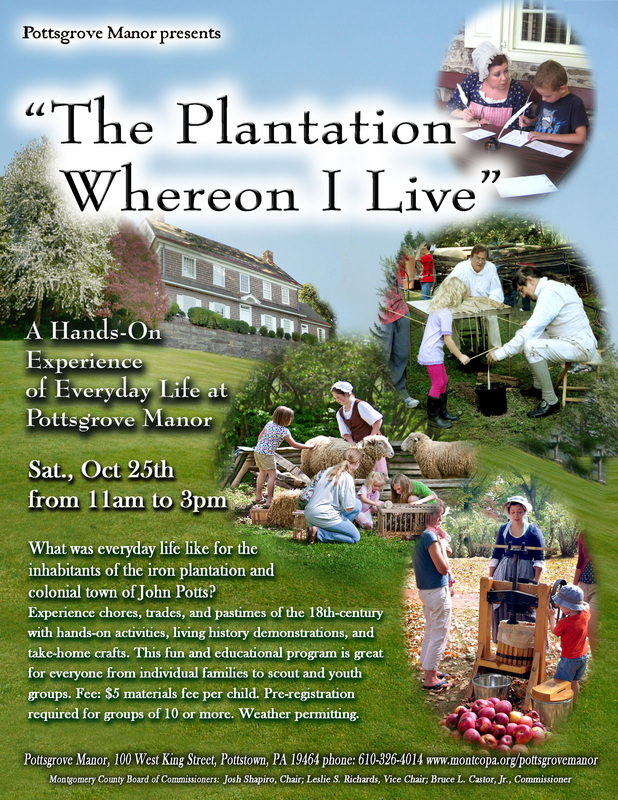 Pottsgrove Manor is operated by Montgomery County under the direction of the Parks, Trails, and Historic Sites Division of the Assets and Infrastructure Department. For more information, call 610.326.4014, or visit us on the web at www.montcopa.org/pottsgrovemanor or on Facebook at http://www.facebook.com/pottsgrovemanor. Summer Classes For All Ages At The Gallery School Of Pottstown! Pottstown, PA – Forty Chances for Creative Fun and a Free Class! The Gallery School of Pottstown, a non-profit community art school, has a huge lineup of classes for all ages planned for this summer. Topics range from traditional drawing and painting to stained glass and sewing classes. Students who register for a summer class by June 1, 2012 are eligible to take a fun workshop for free. They can choose from four great classes: Tic-Tac-Dough, Recycled Art, Fused Glass and Easy Earrings. For more information, and to register, visit this special page on the Gallery School’s website: www.galleryonhigh.com/free.html. Students and parents can also call 610-326-2506 to register. See the lists below for the complete lineup of classes. Full details can be found on the Gallery School’s website at www.galleryonhigh.org. New for 2012 are fun mini camps for kids. All mini camps run from 10am-3pm for 3 days, with a break for lunch and a snack. Children have an opportunity to really engage in fun, comprehensive projects. Topics include Kids Sewing Mini Camp, Kids Pottery Mini Camp and Jewelry for Kids Mini Camp. Classes for kids include Summer Cray Pas, Summer Creative Kids, Summer Crafty Kids, Colonial Crafts, Summer Kids Pottery, Summer Story Sculpting Workshop, Summer Parent and Child Coil Pot Workshop, Summer Parent and Child Fused Glass Workshop, Basketmaking, and Kids Clay: Hand-Building Techniques One Day Workshop. Classes just for teens include Summer Teen Studio, Basketmaking, Spirit Animal Mosaic, and The Heart of The Matter: Personal Essay Writing for High School Students. Classes for adults and teens 16 and older include Altered T-Shirts Workshop, Yo-Yo Flag, Scratchboard, Introduction To Drawing I & Drawing II, Jewelry/Metalsmithing, Introduction to Figure Drawing I & Figure Drawing II, Clay: Hand-Building Techniques Two Day Workshop Clay: Hand-Building Techniques One Day Workshop, and Pottstown Photography Project. Classes for adults include Summer Mosaics, Introduction to Stained Glass, Summer Adult Pottery, Summer Introduction to Encaustics, Adult Basketmaking , Introduction to Fused Glass Jewelry, Summer Introduction to Glass Fusing, Summer Fused Glass Open Studio, Simple Summer Skirt, Stripey Shoulder Bag, Found Object and Recycled Jewelry, and Flash Memoir and Essays for Adults. A community celebration for families with young children will be held on Saturday, April 21 at the Freedom Valley YMCA at Pottstown (724 North Adams Street) from 1:00-3:00. Activities will include a petting farm, moon bounce, Pipper the Clown, Smokey the Bear and over 30 community agencies with games and resources. for this community outreach event. All families with young children are invited to attend. PEAK is a partnership between Pottstown School District and community early learning programs and agencies seeking to prepare children and families for success in kindergarten. For more information, contact 610-970-6655 or visit www.peakonline.org. Kings College in Wilkes-Barre, PA will reopen today at noon! The college evacuated their students and closed in the wake of the recent historic flooding in Wilkes-Barre. Sunday sports and events are cancelled except for Mass in the chapel at 8 p.m. Classes will resume Monday. The City of Wilkes-Barre also lifted their mandatory evacuation order on Saturday for those areas unaffected by flooding. Pony Rides, Face Painting, Violence & Bullying Prevention & Intervention, Magic Show, Juggling, Cross-Cultural Understanding, Conflict Resolution, Low Ropes Course, Nature Hiking Tours, Llama & Donkey Feeding, Home-Made Baked Goods, Country Barbecue, Story Telling, Organic Gardening, Nutrition Crash Course, “Perfect Gentleman” Youth Skills, Basketball, Play Area, Petting Zoo, and Intercultural Dance & Music. Sing-Along led by Singing City Choir. If rain threatens, call 610-326-3008 for info on rain date. It’s that time of year again, Pottstown’s Annual FamilyFest. This year the event will occur on Thursday March 17, 2011 from 5 – 7 p.m. One big change for this year is the venue site; this year’s FamilyFest will be held at Pottstown High School. All the wonderful activities and food will be available on the same floor, with one big plus, no stairs to have to contend with! Our theme for this year is “Participate in Your Community: Pottstown Families Play, Work, & Serve Together”. Family Fest is sponsored by the Pottstown Family Center, Pottstown Parks & Recreation & PEAK – Pottstown School District.